As promised, DataBlitz gaming store has officially released the latest handheld gaming console in the Philippines - the Nintendo Switch - since March 3, 2017. If you are one of those people who have been waiting for its local release, this maybe the day you have been waiting for. However, please do not expect too much in terms of available units especially if you did not pre-order one for you from DataBlitz as this first batch of units is currently prioritized to pre-order buyers. 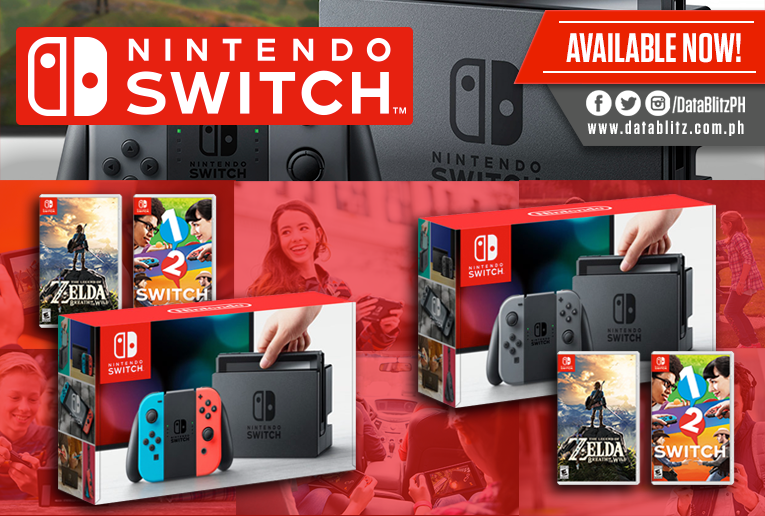 But the availability varies per store location, so the best course of action to take here is contact your local or the nearest stores in your place and inquire for the Nintendo Switch, list of stores and contact numbers provided in the link below. With local release just happened yesterday, a lot of us still have a lot of questions about the gaming console availability here in the Philippines. And here in this post, I will try to provide as many details as I can pertaining to the matters such as official price, items in the box, bundle options and many other things. Please be advised that I am only referring to the units from DataBlitz, one of the most popular local gaming stores, and that I am not sure if the Nintendo Switch is also available from other stores. I created this post to answer questions I get from friends, readers, and followers and I hope that this will provide them all the things they wanted to know. Buy the Console Only without the bundled games? Apparently in the US, the Nintendo Switch is officially retailed for only $299.99 (tax not included) which translates to about Php15,000 in the local currency. The Legend of Zelda: Breath of the Wild game is for $59.99 (Php3,000), and 1-2-Switch costs $49.99 (Php2,500). Knowing that these three are all bundled together for Php24,495, it appears that we could actually get the console alone for a much lower price if possible. Unfortunately, this option is currently not offered but most likely to be available in the future. For now, it's either you buy the bundle for its asking price or wait a little longer. Other bundle options will be posted in the future as per DataBlitz, perhaps with more game options. The first batch of units may be limited at the moment, again that may vary depending on stores, and are of course prioritized for those who placed pre-orders a few weeks back. If you local DataBlitz store has more stock that they can accommodate walk-in buyers then that's an opportunity you should take advantage of. If in any case they are short of supply, good thing is, you can still pre-order for the next batch which according to DataBlitz will come in a few days. Is the price Tag much less when purchased in cash? Apparently this is also one of the most asked questions on DataBlitz' Facebook page. Although I do not know the exact answer, it seems that it does as every one who asked this question on the FB page always got "message sent" or "PM sent" response from DataBlitz. So if you would like to know, I suggest you ask them directly, but do not expect reply so fast due to a large number of inquiries they are getting at the moment. Or contact your local DataBlitz store (see link below). However, some buyers have confirmed that there is a Php1,000 discount when bought in cash. Is the Super Bomberman R also available today in the Philippines and can it be bundled with the Nintendo Switch instead of any of the two? Sadly, it is not and there is no word from DataBlitz yet except for that new announcement will be released as soon as they have the game or new bundle options with the Nintendo Switch.